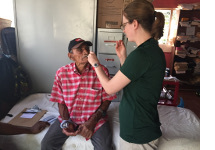 The Lawrence Family Medicine Residency for the past fifteen years has worked with the Bridges to Community organization to provide medical care in the Mongallo region of Nicaragua. This was my first experience with the group. We worked for two weeks, both in a Nicaraguan health post in Mongallo and in traveling clinics to the communities of Trinitaria and Caño Sao. All of these communities are rural and have limited medical care, with Trinitaria and Caño Sur only receiving ambulatory care once a year from the Lawrence physicians. We cared for a total of 663 patients, including prenatal patients, children, and the elderly. We provided care for a variety of conditions, including musculoskeletal disorders, dermatologic conditions, diabetes, and hypertension, which are conditions we see commonly in the United States. We also treated those with illnesses more endemic to Nicaragua, including parasitic infections, anemia, gastritis, and malnutrition. We spent time in the maternity clinic built by Bridges to Community in 2014 and toured the construction site for the new health center in Hormiguero that is slated to be completed in the summer of 2018. I hope to work again with Bridges to Community and thank the Benjamin Josephson Fund for its generous support of our work.